About "KJV Baby's New Testament With Psalms Light Blue (Red Letter Edition)"
Red letter ^ Presentation pages ^ Color presentation certificate ^ Gift-boxed ^ Limp binding ^ Silver page edging ^ 512 pp. 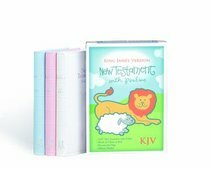 With soft-color, durable bindings, these precious little New Testaments with Psalms add special meaning to the most memorable times in a young child's life. Make a promise to the new baby in your church family, and share God's Word with them. There's not a more thoughtful gift This red-letter edition New Testament also includes Psalms and is perfect for presentation on baby dedication day. Gift-boxed with silver page edging.